looking GOOD! and that little girl is going to be beautiful! so what book were you reading? name hint! cute, cute!!! 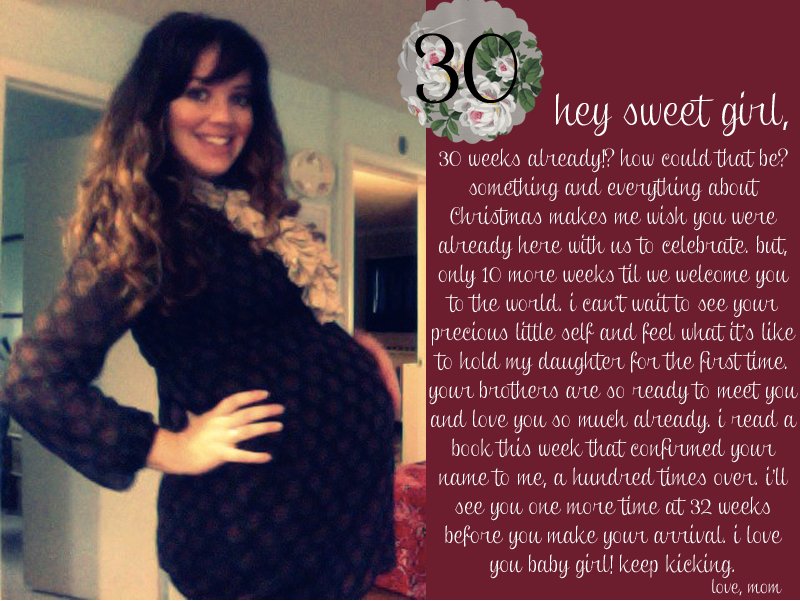 I am in love with mom blogs and pregnant women right now. we are due in 4 weeks with a surprise bambino (currently have 3 little boys) so I just love ewwing and awwing over lovely pregnant bellies :) Have a very Merry Christmas! Aww...so happy for you guys. I love your little letters to baby girl. precious! i love it friend. cannot wait to see her sweet face :) she's going to be beautiful...just like her mama. love u! you are too cute!!! 30 weeks was always the "I'm almost done!" feeling for me! I'm only 26 weeks and I'm already feeling like I should be almost done!!! The more babies I have the more impatient I get :) Glad all is going healthy for you and baby! You look gorgeous!! I'm so excited for you! you look BEAUTIFUL danielle!!! oh I can't wait! we will hopefully meet our new little girl any day now - Im 38 weeks today but already progressing! Cant wait to meet your little one too!! :) Merry Christmas!! okay, i didn't know that you were having a girl! get excited!!! having a girl is amazing! i can't wait to meet her!!!!!!!!!!!!!!!!! cant wait to hear the name! i can't wait for you to meet your baby girl!